Okay I am sick…so admittedly I really am not up to doing a lot. 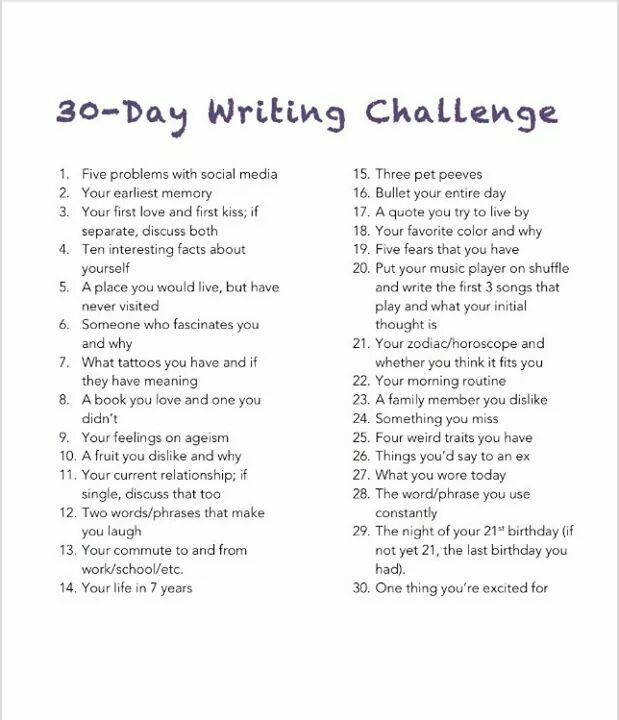 I am hoping a small writing challenge will excite my brain. And this seems like it might just be fun. But don’t fault me for it being slightly less than my usual. So day one….Name five problems with Social media. 1. No one truly listens to each other. Everyone has an opinion and social media is often the outlet of choice. So because everyone is posting their opinion, no one really wants to hear it. So we fail to listen to what is really being said. 2. Many people are not being who they are on social media. There is way too often a who I am in real life and who I am online. The line should not exist. 3. Social media is not often a safe place. Images that are triggering and or cruel often make it past the filters set in place to create a safe experience. And then one’s that are non harmful end up being pulled. 4. Posting random things because you like it will cause your family to worry. 5. Nowadays, social media is considered to be something everyone should do. Oversharing is no longer seen as bad. Some days it feels like I have too many plates spinning. Hence the Picture above. (credit goes to Jim Hunt Illustrations…for the awesome image.) Today was no exception. Somehow all those various hats…. (mother, Writer, adult, Social media guru, blogger, Friend, Girlfriend, cook, gamer, etc, etc) all seemed to fit. I kept moving and I got stuff done. Even found time to watch a favorite movie with my little girl. Somedays it feels like the dust settles over me. creating a blanket. making it hard to move. Not today. Today I wasn’t sitting long enough for the dust to settle. Today I kept on my feet and managed to get things done. I maybe didn’t do as much in crafts as i did in writing, or maybe I was less attentive to this part of my life as I was to that. Still no broken plates. How about you? Any broken plates today? Did the dust settle? If so that is okay. Tomorrow you can try again. He always seemed to be a mark that poets of my generation were expected to try for. While I enjoy his work, I found others who touched my soul more.